Tu B’shevat around DC: 5772! Tu B’shevat,sometimes referred to as “the Jewish arbor day,” was a tithing holiday in ancient Israel and a way to count the seasons. It was never, however, without environmental impact; the Talmudic rabbis revered the trees of the land and dedicated this “birthday” for protecting fruit trees. By the medieval ages the Kabbalists added a special seder, modeled after Passover, and today advocacy has taken a strong foothold with planting and teaching about sustainability. 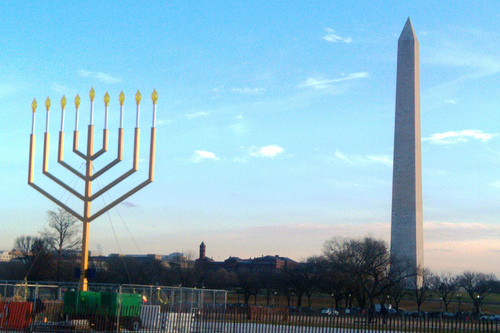 The DC Jewish community has several options for celebrants. Take a look below, and be sure to enjoy the fruits of this holiday! 😛 The official dates this year are from Feb. 7 to Feb. 8. Temple Emanuel combines two environmental holidays, featuring music programs especially aimed towards kids. Tu B’Shevat: Trees and Me! The Jewish Community Center of NoVa offers crafts and songs to celebrate the birth of trees. All-inclusive night at Ohr Kodesh! Jews United for Justice and Etz Chayim DC are looking locally at urban trees and sustainability in the District. Sixth & I, led by Rachel Farbiarz and Jared Gottlieb, takes on the spiritual aspect of the holiday with text study and meditation. Fruit sampling, wine tasting, and Israeli hits by DJ! The Jewish Community Center of NoVa offers a seder and sing-along with an Israeli twist. Celebrate with the Georgetown synagogue. Find your High Holiday classes below!